When it comes to starting an email marketing campaign, generally businesses think about how often to send emails, what content to include, which audience to target, etc. What isn’t often considered is who to send the email from. It’s coming from their company, right? But whose name, if any, should they use for the “From” field? There are a variety of options for this, and believe it or not, which choice you make does have an influence on the success of your campaign. Below we’ve explored using various alternatives from a company’s name, to an employee’s name, to the founder’s name, and more. Read on to find out how your choice will impact the outcome of your email marketing campaign. Which “From” Names Should You Test? The name of a customer service representative who speaks to a lot of customers when they call your business. All of these names are worth testing to see which one(s) elicit the most clicks and the least amount of unsubscribes. Seer Interactive created an excellent case study where they sent emails from the founder of their company, Wil, as well as an employee of the company, Emma. 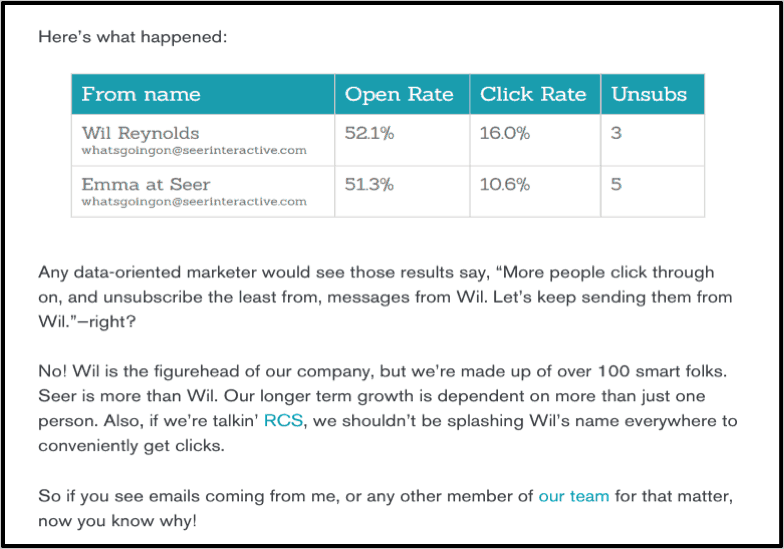 Their data showed that more people chose to open emails from Wil than they did from Emma (see screenshot below). That being said, I didn’t fully agree with the way they chose to conduct this test, which brings me to my next point. How Long Do You Need to Test a “From” Name to Get Accurate Data? What struck me about the Seer Interactive case study is that they used Wil’s name to send emails essentially from the day the company was founded, so a long time. When they tested the alternative name, Emma, they chose to only send one email to a handful of people who attended their events. This means that essentially, the audience was choosing to either open an email from a name they recognized and had received emails from for an extensive period of time, or from a strange name from whom they had only received one email. For accurate data, it’s important to send the same amount of emails from each field you’re testing for the exact same amount of time. I do believe that the longer you test the sender field the more accurate data you’ll receive, but I also understand that not all companies have the luxury of testing this field for an extensive period of time. With that said, I definitely encourage you to send more than one email from each sender, with the most important thing to focus on being that you send the same amount of emails at the same intervals for each sender that you’re testing. Fortunately, most email campaign software has the capability to do the test for you. Campaign Monitor, MailChimp, and Active Campaign all have the tools built in and are good choices for when you’re ready to start a test! Once you’ve determined which names to test and how long to test them for, you’ll need to decide what “success” looks like to you. The Kissmetrics Blog suggests going back through your email campaign history and reviewing that data to create your goals. For example, if in the past your click rate was 15%, perhaps you’ll want your goal to be 20% for this new campaign. Click through rate, the number of people who opened the email, and the number of people who chose to unsubscribe after opening are all great metrics to analyze. However, the number of people who choose to open the email is the most important metric because it’s directly correlated with the sender field; people are more or less likely to open an email based on who it’s from, whereas the unsubscribe rate could be due to the content of the email and not the actual sender’s name. At the end of the test the data should speak for itself, and you’ll have a good idea of which field produces the best results for your company. Definitely use the software resources listed above as they will make retrieving the data and results much more accessible for you. Does Transparency Have an Effect on Your Audience? One more factor about the Seer Interactive test that I think is interesting is that they chose to ignore the data and results obtained from their test in favor of audience transparency. In the screenshot below, you can see that although the data favored emails sent from Wil, they felt that continuing to use his name in the sender field was dishonest to their audience. Instead, they chose to go with total transparency and use many different employee names in the sender field to show a true picture of their company. So, depending on the results of your data, should you ignore the numbers in order to be upfront with your subscribers? Unfortunately, Seer Interactive seems to be one of the only case studies out there, so any assumptions would be just that—assumptions. I believe that transparency is incredibly important, but that it doesn’t necessarily have to correlate with the name(s) you choose to use in the sender field. When it comes to this test, I think consistency in this situation is a more effective marketing tool than transparency. While I don’t advise making up a fake name to use when sending emails, I disagree with Seer and think that it’s ok to use the company founder’s name, or an employee’s name, even though that person may not be the only one representing the business. Again, this is of course all personal preference as a business owner and a consumer and not based on any real data—yet. I would love to see more case studies on this subject and will be updating this post when mine is complete! Regardless of your choice, transparency is important and Seer Interactive absolutely has the right idea. Show transparency to your customers by asking their permission before sending them emails, letting them customize how often they receive emails, being open in your email subject lines, and asking for their feedback on your marketing campaigns. All of these things will go a long way in building lasting relationships with your consumers. If you’re interested in learning more about how to incorporate transparency into your marketing strategy, this article by Cio and this one by Greenlight are both good resources to use. Which name(s) are you currently using in your sender field? Have you tried testing out other alternatives, and if so, what were your results? Comment in the section below!